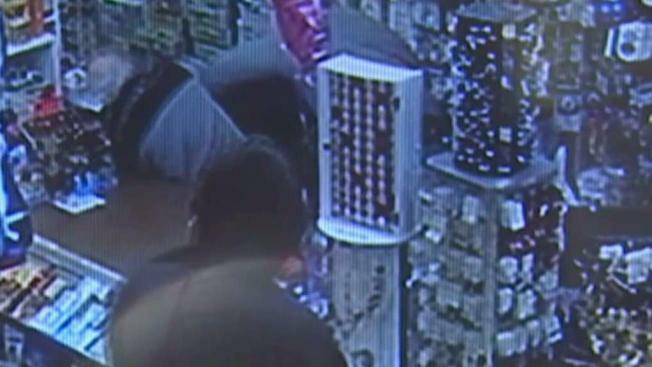 A store clerk in New Jersey was beaten by two gun-wielding robbers while his co-worker fought back with a chair in a wild robbery all caught on video. The workers say two masked thieves stormed a store in Edison and in less than four minutes pistol-whipped the man behind the counter and plucked as much money they could from the register. Syed Ashraf was working behind the counter when the duo ran inside, he said. He put up a fight to protect the register while a gun was pointed at his temple. Ashraf told NBC 4 New York that he fought back because he knew the gun wouldn’t fire after he saw the bullets fall out. “The weapon was open and the bullets fell down,” he said. While Ashraf was fighting back, his co-worker, Antonio Barrios, jumps in to help. He said he heard the commotion and threw a chair at the suspects. When the masked suspects were unfazed by the blows, Barrios said he ran out the back door and called for help, using a phone a couple who was driving by let him use. The clerk tells News 4 New York that police only caught one of the suspects, but the Edison Police Department have not responded to requests whether they are still looking for suspects. The clerk suffered injuries, but he returned to work the next day, he said.